To correct for the effects of vignetting towards the corners of an image, flat frames are used. A flat frame is an image of a uniformly illuminated field and their taking is described in the two CUP books. It is vital that these are taken with the camera having the same orientation as at the time when the light frames were taken and that the focus is unchanged. In carrying out some tests of the TS quad astrograph I realised that, under some conditions, it is possible to derive a flat frame from one of the light frames which could then used to correct for vignetting. For this technique to be employed, there must be some light pollution in the frame (quite common in the UK!) and that the imaging field must be at a high elevation so that the light pollution is uniform across the field. There is one further proviso in that a use of flat frames is to eliminate the effects of doughnut shaped dust motes caused by dust on the sensor. This technique cannot do this, so a clean sensor is required. I had chosen to process a set of 13, 20 second, exposures of a region around Deneb in Cygnus which lay almost overhead. These were initially aligned and stacked in Deep Sky Stacker as described in the article ‘TS Imaging Star Quad Astrograph Review’. It includes my method of removing light pollution. 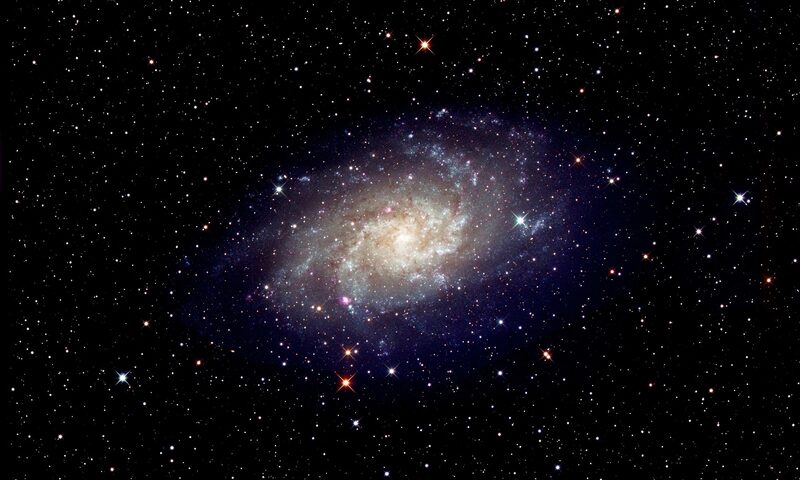 The first step of which is to produce an image with the stars removed. It struck me that this is, in effect, producing a flat frame. 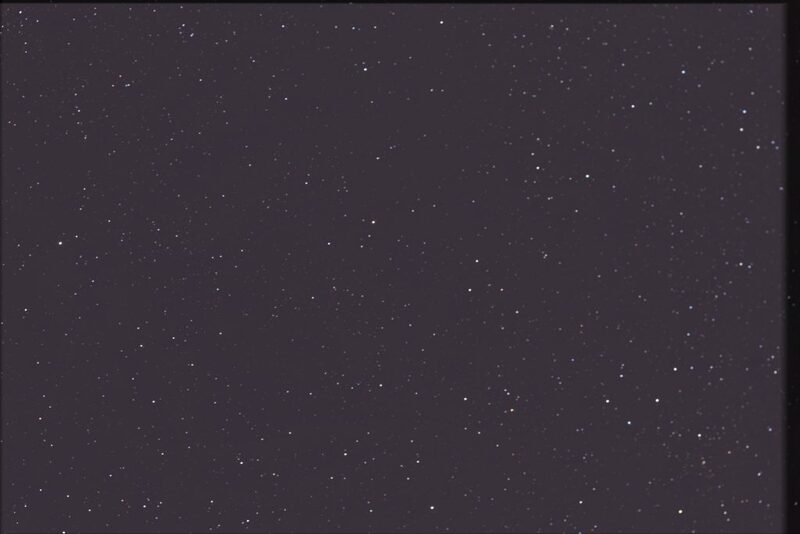 So, if stars were removed from a single frame a flat frame would be obtained and so could be used as such in the aligning and stacking process. To demonstrate the result of making and using such a flat frame I first used Deep Sky Stacker (DSS) to carry out the alignment and stacking iteration without using a flat frame. The vignetting in the extreme corners is apparent. There was some moonlight in the sky so, as can be seen from the DSS screen grab, the red (light pollution) and blue histograms were over to the right of the green histogram. The second image shows the slightly stretched output from DSS which also shows the vignetting. To produce a flat frame I applied the ‘Dust and Scratches’ filter within Adobe Photoshop to a single frame using a radius of 18 pixels. 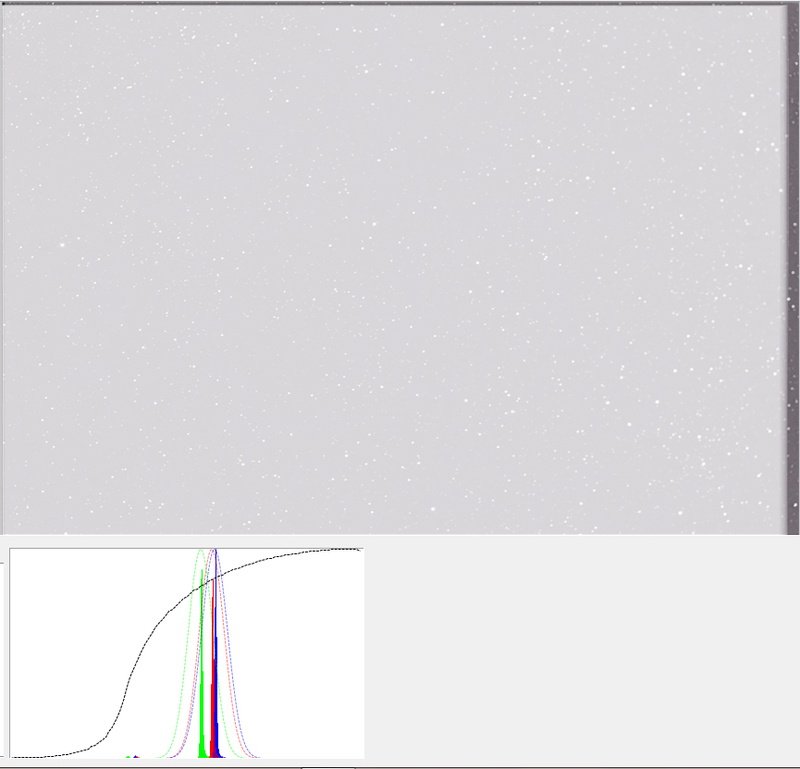 The filter thinks that the stars are dust and virtually all evidence of the stars disappeared. Should any remnants of very bright stars or nebulae remain, these should be cloned out from adjacent areas of the field. 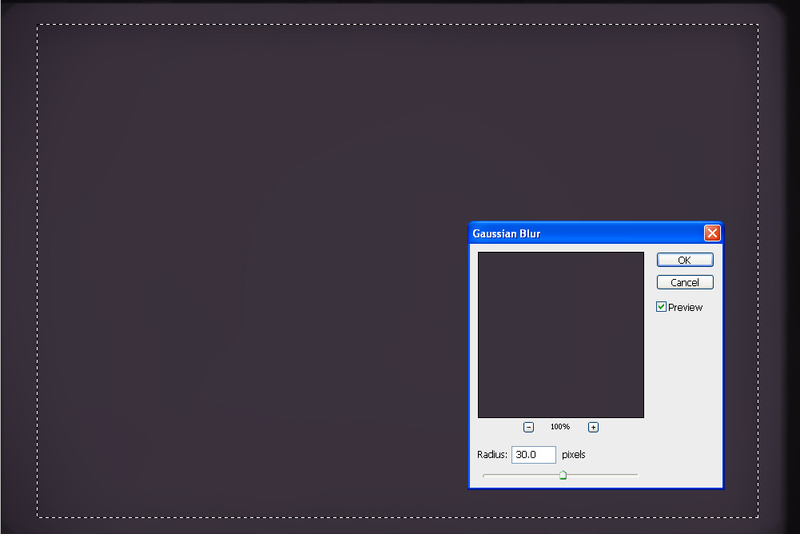 If the area away from the edges of the field is selected (to avoid edge effects) as shown below, a Gaussian Blur can then be applied with perhaps a radius of 30 pixels to smooth the field further. This is now our flat field. It is, by its very nature, a flat field having the precise camera orientation and focus as when the light frames we taken. 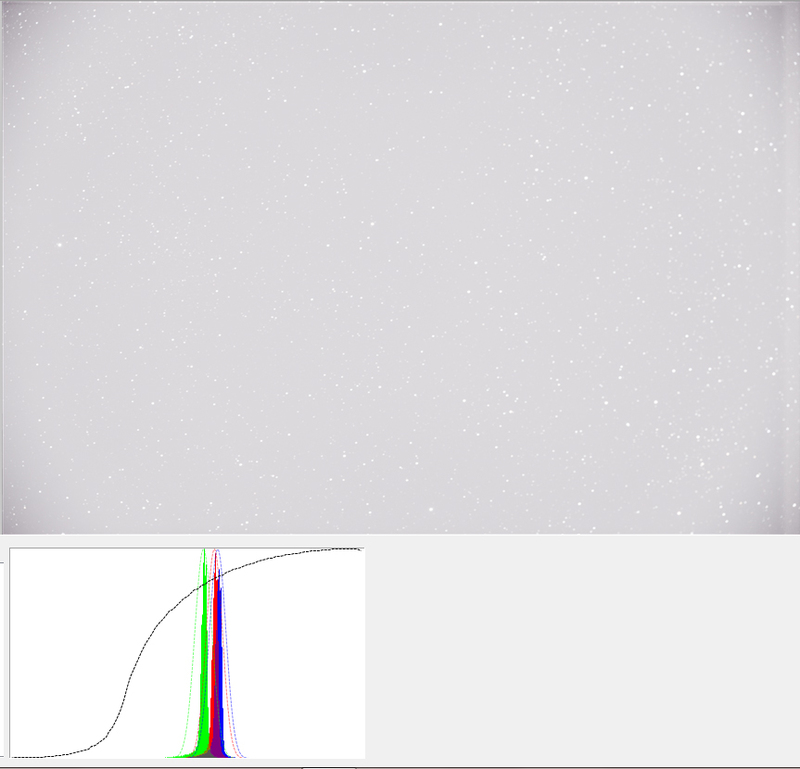 Though derived from a single, and hence noisy, frame the combined effect of the two filters is to give a very smooth result – a requirement of a flat frame and why, in general, when taking flat frames a number are averaged to remove the noise in the resulting ‘Master Flat’. DSS was then used to produce an aligned and stacked image having loaded the single flat frame along with the light frames. The DSS screen grab shows that the vignetting had disappeared. 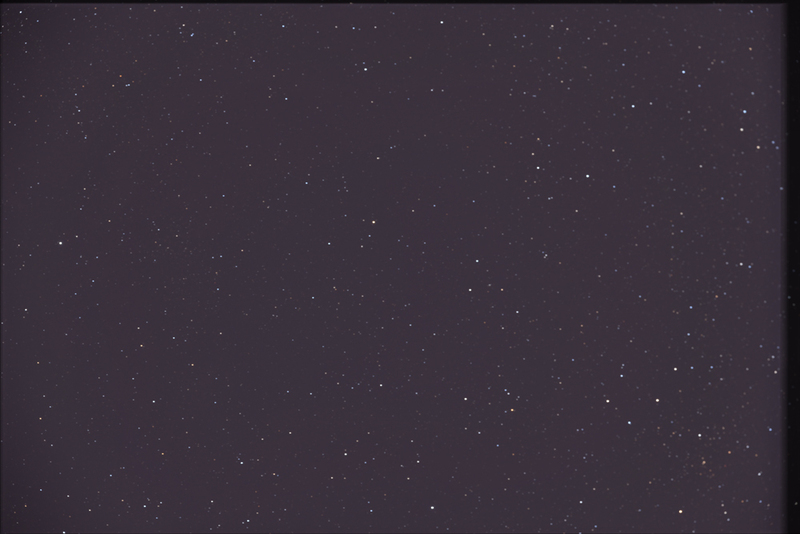 The dark bands at the extreme top and right were due to the fact that the telescope alignment was not quite correct so that there was some drift of the sky relative to the sensor during the taking of the sequence of images. Incidentally, this may not be such a bad thing as it helps to remove what is called ‘colour mottling’ which is caused by variations in the pixel sensitivity. By moving the image across the sensor, the variations tend to cancel out. The image below was the slightly stretched output from DSS. There is no obvious vignetting as confirmed by measuring samples from the centre and corners. Perhaps surprisingly, the process worked very well. Searching the web, I can find no evidence of anyone having tried this before, but hope that it might sometimes be useful to astroimagers. There is an article on creating an ‘artificial flat field’ on the Corius Astronomy website but this is a technique applied to the final image not to the aligning and stacking process. It corresponds quite closely to the way that I remove light pollution. So I am not sure that the term ‘artificial flat field is’ really correct in that case. The technique described here was employed in the analysis of the frames taken when reviewing the TS Imaging Star Quad Astrograph which is a further essay in this digest and which includes a method of eliminating the light pollution present in the above image.